You may receive updates from Jasic Worker Solidarity, the creator of this petition. Please join us in signing and sharing this petition to call for the immediate release of the workers and their student allies unjustly arrested for union organising and solidarity actions at Shenzhen Jasic Technology in China since July 2018. Released student supporters are disciplined by their colleges, under police surveillance at home. This is the most severe repression against workers and labour activists in China since a crackdown on labour rights organisations in 2015. #Release all detained labour rights group staff. Dorothea Hofmann	Solidaitat International e.V. In May, workers at Shenzhen Jasic Technology in southern China reported to the local authorities the company’s labour rights violations such as illegal scheduling practices, an illegal system of fines, and the underpayment of housing fund contributions. Acting on the advice of the All-China Federation of Trade Unions (ACFTU), workers were starting to organise a union in accordance to China's Trade Union Law. Their co-workers signed membership forms in support of union recognition. Rather than recognising the union, the worker organisers were accused by Jasic and the ACFTU of illegally unionising, and were assaulted and fired by Jasic. When the fired workers staged protests, they were arrested on July 27 by the authorities. Progressive college students, workers, and labour rights activists in China organised solidarity actions for the Jasic workers over the following weeks. But they too were harassed and arrested. 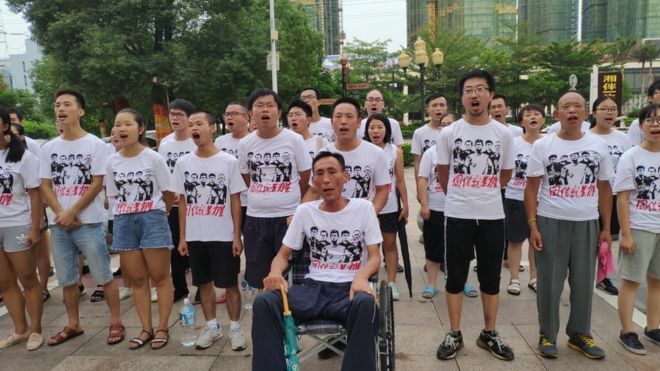 In mid August, two staff of a labour rights group in Shenzhen were detained and charged with “picking quarrels and provoking trouble” for alleged role in supporting Jasic workers. And, on August 24, riot police raided and arrested more than 50 student and worker supporters. Today, many of the 70 arrested workers and allies remain either detained or have their freedom significantly restricted. Released students are under police surveillance at home, and some have been disciplined by their colleges. In protest, 5 students went on hunger strikes. We express our support for the right of workers to organise unions, and the right of their allies to express solidarity, and call for their immediate release!